AUD/USD Short: Will 1.0600 Hold? – 200-Pip Win!!! Oh dear, my trailing stop on my AUD/USD short just got hit at 1.0300. As it turns out, the weaker than expected Australian quarterly CPI wasn’t enough to push AUD/USD to the 1.0200 handle as I had hoped. Later on, weaker than expected U.S. durable goods orders data triggered a dollar selloff, which eventually boosted AUD/USD. I’m not complaining though as this means I’ve bagged 200 pips on this one! Yipee! In fact, I’m pretty happy about how I managed my open trade since I didn’t want to let go of most of my recent profits anyway. I badly needed a win to end my losing streak and put my account back in the green – and that’s exactly what it did! Not bad for a swing trade, huh? Do you think I could’ve played this one better though? I look forward to reading your feedback so don’t be shy to drop a line or two in the comment box below! Now that China, the RBA, and the BOC have shown their cards, I think it’s time to lock in some pips today! After dragging the Aussie on the heels of China’s weak GDP release, it looks like the comdoll bears are showing signs of exhaustion. 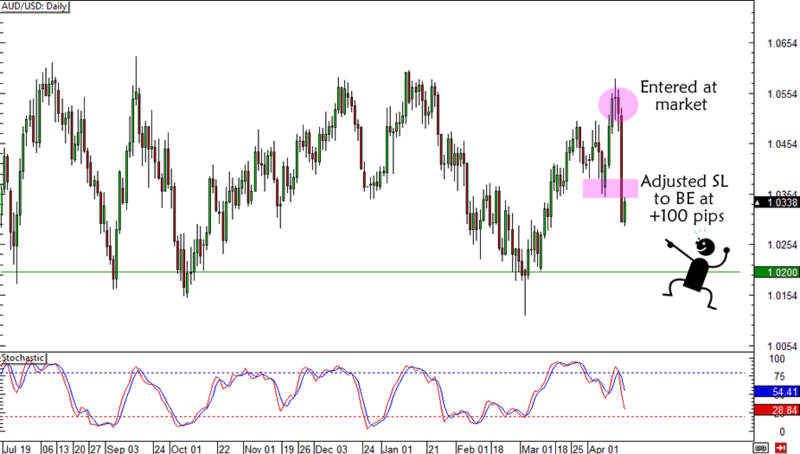 AUD/USD is encountering strong support at the 1.0300 major psychological area, which is right around last week’s bottom weekly ATR. Since there are no more major data scheduled from the comdoll countries save for Canada’s inflation numbers tomorrow, I decided to lock in my gains at 100 pips by moving my stop to the 1.0410 level. At this point any comdoll price action will most likely be based on risk appetite, which could be tricky ahead of the G20 meeting. How about you? Any traders out there who are also thinking of closing/adjusting your AUD positions? Hit me up! Yipee! Thanks to weak Chinese GDP, AUD/USD dropped like a rock in today’s Asian session and reached the 1.0400 level. The actual figure came in at 7.7%, a far cry from China’s usual double-digit growth, and a few notches below the consensus at 8.0%. I did have a hunch that the GDP would disappoint since China’s economic releases have been subpar since last week! Because of that, I decided to move my stop to entry now that I’m up by a little over a hundred pips. This should provide enough leeway for the trade should AUD/USD still pop up during the release of the RBA meeting minutes and new motor vehicle sales tomorrow. There aren’t any major reports from Australia for the rest of the week as I suspect that bleak Chinese reports could keep weighing on the commodity currency. However, I’d still keep close tabs on U.S. data and comdoll reports that I noted in my Comdoll Trading Kit for this week. That’s all I got for now! I’m pretty psyched that I’m holding on to a risk-free trade for now. Not gonna lose this one this time! It’s option B for me this week! A couple of hours ago Australia released its employment numbers, which showed that job losses in March almost offset the great job gains that were printed in February. Sound familiar? That’s because that’s what also happened with Canada’s jobs numbers! Anyway, I decided to go with plan B when AUD/USD dropped like a rock following the release. I didn’t want to miss the downtrend, you see, and the setup still provided a good reward-to-risk ratio anyway. I placed my stop loss above the 1.0600 major handle, which could keep my trade open until after the US retail sales report today. Shorted at market (1.0510), stop loss just above the 1.0625 area, profit target at the 1.0200 range bottom. How about you? 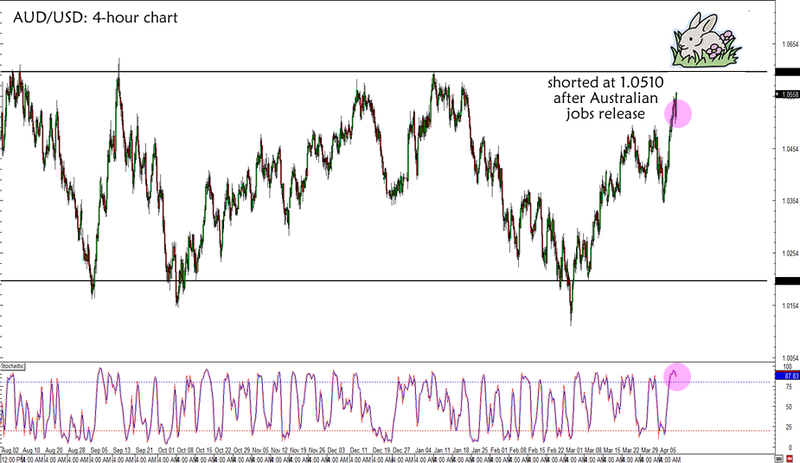 Anyone here who has shorted or is planning to short the Aussie? Hit me up! Guess what? 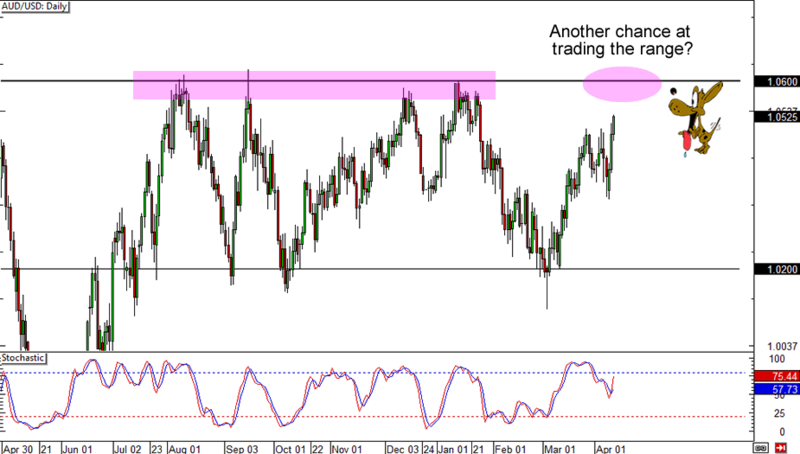 I’m watching AUD/USD’s long-term range once more! The pair is close to testing the 1.0600 major psychological resistance, which is the top of the range I’ve been looking at when I went long AUD/USD at 1.0200 earlier this year. 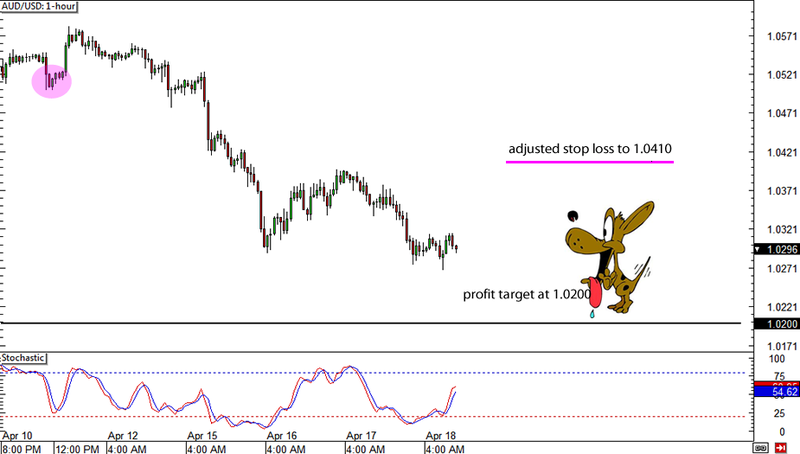 At that time, my trade didn’t work out too well since my stop was too tight and I was extremely careful with my trade. This time around, I’ve learned to set appropriate stops for the type of trades I’m taking. Since this is going to be a swing trade, I decided to set a wider than usual stop of 100 pips on my short trade. 1. Chinese data came in weak. Earlier this week, China released a bleak annual CPI figure of 2.1%, below the 2.5% consensus and the previous month’s 3.2% reading. This shows that the PBoC has scope to ease monetary policy if needed and will probably not tighten any time soon. After that, Chinese trade balance also came in weak and even printed a surprise deficit! 2. Australia is also showing signs of weakness. Minor reports from Australia this week showed that the Land Down Under is still on a bit of shaky ground. The ANZ job advertisements figure printed a 1.5% decline after showing a 3.0% increase previously while the Westpac consumer sentiment report revealed a huge 5.1% drop in confidence. 3. Jobs data could disappoint. Remember when Australia printed a surprisingly strong labor report last month? Well, analysts are saying that a huge downward revision could be in the cards as the strong figure was subject to statistical error. On top of that, employment in March is expected to be down by 6.7K. This report is due tomorrow so I’ll definitely keep close tabs on that. 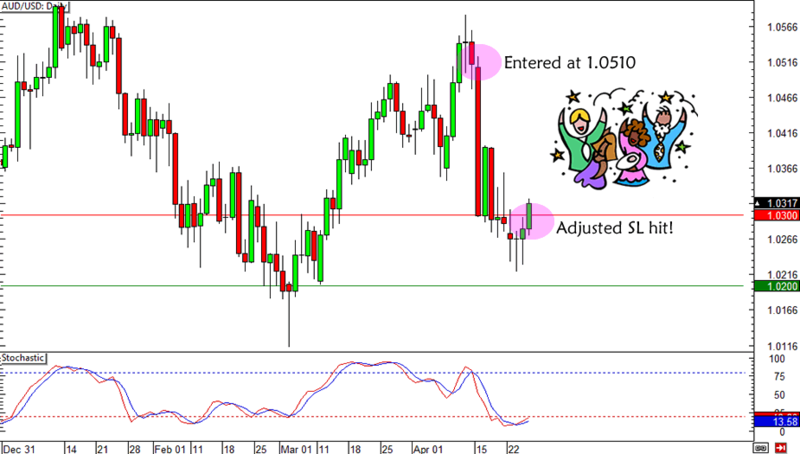 b) Short AUD/USD at market if the jobs report comes in significantly weaker than expected. I’ll put a wide stop still above 1.0600 and aim for 1.0200. Do you think I’ll be able to catch some pips with this plan? I’m a little concerned about U.S. data, namely the FOMC meeting minutes and retail sales figures, as these could result in dollar-selling once more. What do you think?